Although I am more of a September lover, I will not deny that February 14th is also a special day. With the help of some motivation I acquired from this special day, I prepared a scene where a bunch of heart-shaped ‘valentine’ cushions are hanging. I created four different cushion models using Marvelous Designer to avoid repetition (I did not want to lose the uniformity so the differences were actually quite subtle). I played with the pressure and elasticity options until I got my desired result. After the modeling process, I imported the cushions as OBJ files and assigned UVW unwrap modifier for the textures to fit just fine. I created the stripes using Max’s checker texture and the heart/bitten heart texture using Illustrator and Photoshop. I created several multi/sub-object materials which consisted of three velvet materials with falloff maps assigned to their diffuse slots. For the background cushions I used MultiScatter, an extremely versatile tool in scattering objects both in 2D and 3D environments. For the post production, I created a VRayZdepth map and added it to the alpha channel on the image in Photoshop to get the lens blur effect I desired. 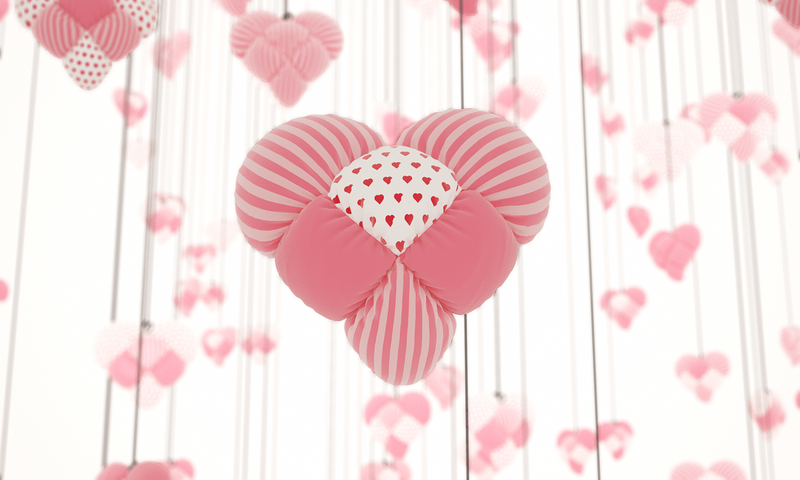 Posted in UncategorizedTagged 3D, 3dsmax, blur, cs6, cushion, day, depth of field, fov, hearts, illustrator, lens effects, marvelous designer, multiscatter, obj, pattern, photoshop, stripes, texture, valentine, valentine's day, vrayBookmark the permalink.